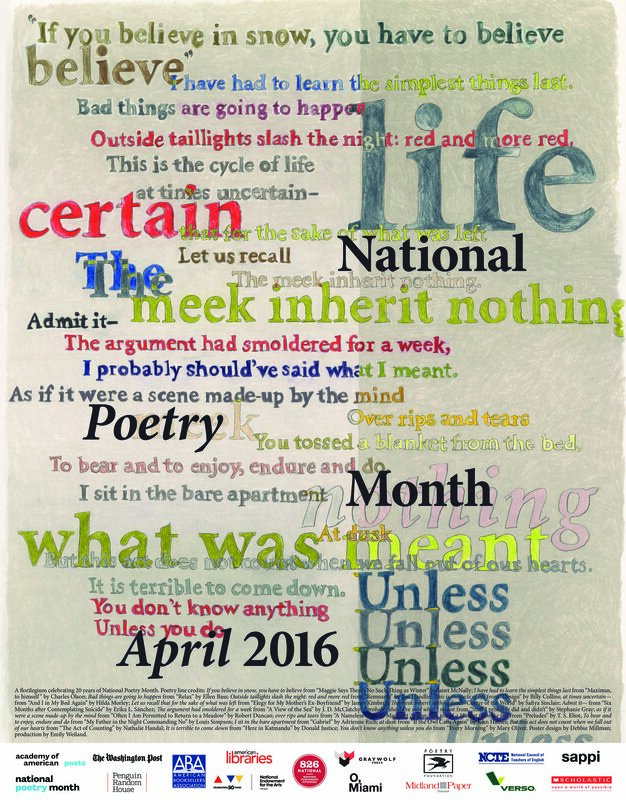 If the purose of the poster is to promote National Poetry Month, it fails miserably. What a confusing mishmash. I totally agree. I don’t think the snippets are interesting. And there is no focus blah blah blah. I find it more annoying than useful. Ha! Well, the logo design sounds like lots of fun. But I’m even more eager to see your posts!!! Good luck with it, Jennifer! Or maybe I should say break a leg! Interesting post. I could never figure out why T. S. Eliot called April the “cruelest month.” I agree that it might instead be called the most humane month. I would like to know what is cruel about it? This line gets quoted so often (by people who have no idea what it means) that it is nauseating (the frequent quotations, that is, not Eliot’s words). The way I read those lines is that the speaker resents April (or spring) for stirring up memories and thus desire that are longings that make him feel worse. He felt better when he was numb. But you’re right, I’m pretty sure a lot of people haven’t read “The Waste Land” so why quote from it if you haven’t?! hah Thanks so much for stopping by, Roger! I really like your blog. Seen (by me) : Poets have the most compressed emotions, most compressed writing. How can we know poets have the most compressed emotions? On paper? Or for real? haha Yes, you’re being grilled . . . . These all lead me to believe that poets’ emotions are compressed. I’m not calling compressed emotions a bad or good thing. It just is. Hmm, interesting. I’ll have to think on that. Or feel on it. Or write a poem! Just reading a book about evil and what makes people do evil things. It seems most people who do evil are a lot like people who don’t so it’s no surprise that people can mingle in beauty and ugliness at the same time. Most people who do evil never planned to do it but once they do, it makes doing more evil easier. It’s scary ! Also people who do evil tend not to see things from the victims’ viewpoint. They tend to think either they’re doing something for the betterment of humanity or that what they’re doing is not such a big deal. I had to put the book aside for a while because it was disturbing. So disturbing. Why are we (as in humans) so fascinated with evil and evil people anyway? I think there is some truth in that evil continuum that we can all slide along because look at how evil normal people can be in time of war, for instance. I am thinking of people who rat out others, etc. Maybe even more interesting is what keeps from people from ever (knowingly) doing evil!!! I’d have to think too long about your question, Luanne! How about movies? I like Woody Allen’s movies but, OMG, what a creep! Woody Allen exactly!!!! Thank you! I’m also not a fan of the poster. I like collages, but there’s no focus here. As far as creepy awful people who produce beautiful work (poems, music, art, movies, etc. )–I think there are probably more than we know. Humans are complex. Didn’t Pound go insane, or perhaps he was always mentally ill? No focus at all. I feel as if I fell into a barrel of grain. Ick. Yes, Pound was insane. I don’t think he was always insane. He had a lot of poet friends when he was younger and they seemed to have good conversations. I think he began to obsess on his topics as his illness developed? Of course, I am not his shrink . . . .
Oh man. That would be a moral dilemma, wouldn’t it?! I guess mental health professionals hear it all. Definitely do, Dianne!!! Hahaha, a dog’s breakfast. That is great!!! Doesn’t it, though?!!! I think it’s important to separate an artist’s humanity from his or her work. The work can be valuable, even if the artist is a monster. We’re all flawed, after all. Offhand, i can’t think of any writers I love who are known jerks, but I am sure in time I can think of a few! I don’t really mind the poster, but it doesn’t stir much in me either way so it’s probably a fail. Yeah, and you have an artist’s eye, so I am glad you sort of corroborate what I think about this stinker. Provocative discussion and responses to your post Luanne! Poster: a trend, as I know from my husband who teaches graphic design at a university: he says that they want to convey a concept, but they have not used a clear visual hierarchy. Too cluttered. Second topic: so many things I love (movies, paintings, poems) were created by some of the worst people. I can accept it for the most part. Picasso was evidently narcissistic and egocentric, and Hemingway was a bully, according to one his biographers, as well as a few of his friends. Diego Rivera, major philanderer. How wonderful, then, to celebrate artists and writers who were also decent and good people, or at least were not destructive people to others! A tribute to creativity? It does not distinguish? Ah, I miss you, Carla! I wish we still shared an office! Creativity does not distinguish. How true! And sometimes how frustrating ;)! Miss you too, Luanne. Maybe we could do another poetry reading together later this year? Just a thought. Or perhaps next year if things are still so busy for both of us. HAH!!!! Thank you, Robin!!! I have thought this for years, used to mention it in children’s lit classes I taught, and few agreed with me!! I find those books to be very mean, especially James and the Giant Peach. The “voice” of the books are mean to so many, including overweight women. There is just a nastiness that is not offset by kindness, compassion, etc. Thank you thank you thank you. About your mother, yes, that generation was/is also the same way about Elizabeth Taylor regarding Debbie Reynolds . . . . I have struggled with learning, after I’ve admired someone for a long time, that they have done evil things, or at least committed actions I can’t condone. Woody Allen is a great example because he and Soon-Yi are still married, probably his longest marriage yet. So one might argue that Soon-Yi was older than her years, yadda, yadda. But it’s still creepy and I don’t think I can ever watch Manhattan again (although I had a hard time with Allen’s character having an affair with a teen-ager then too. He was funny when frolicking with adult women, not at all with very young ones). What’s also difficult for me is the stories about artists like Ray Charles, Al Green who supposedly were abusive toward the women in their lives. Not as devastating as learning that a famous poet was a Nazi collaborator, but troubling nonetheless. Ugh, gotta go just as I went to respond hah. The poster doesn’t encourage me to read poetry, but your blog does Luanne! Aw, that is SUCH a nice thing to say, Andrea!!! About the blog haha, not the poster. That poster is a dog’s breakfast, as Dianne says! !